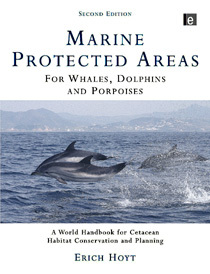 Published 2011 by Earthscan, London and Washington, DC, this insightful WDCS book on marine protected areas (MPAs) and cetacean habitat was written by Erich Hoyt, WDCS Senior Research Fellow and Global Critical Habitat/ Marine Protected Area Programme Leader. For more about the author, click here. Worldwide in coverage, the book reveals the inside story on existing and planned marine protected areas (MPAs), marine reserves, national parks and sanctuaries for whales and dolphins in national waters and on the high seas of the world. Follow ground-breaking efforts to protect the ocean with fin and sperm whales in the Mediterranean to the coldest part of the Antarctic, the marine wilderness of the Ross Sea, with minke and three kinds of killer whales. This story of pioneer conservation efforts in the marine realm is designed to be a key resource for scientists, research institutions, students, wildlife conservation agencies, MPA managers, and anyone who cares about whales and dolphins, and the special places where they live. 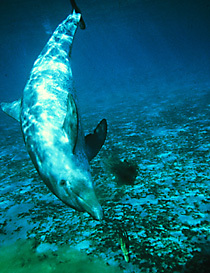 Since most of the world's MPAs promote whale and dolphin watching and responsible marine ecotourism, the book is also being used by keen cetacean watchers to find some of the best places to watch the 87 species of whales, dolphins and porpoises in 125 countries and territories around the world. or through the publisher Routledge (previously Earthscan). For author interviews or for more information on quantity orders and discounts, click here. Along with the book, a detailed poster map has been produced to show the more than 700 cetacean MPAs and sanctuaries worldwide, with illustrations by Pieter Folkens. For information about obtaining a copy of this special map, available in sizes A0 and A1, please email.